In Bridgeton New Jersey there is a series of seven colorful buildings on the main street. These buildings are known as the Seven Sisters. The Seven Sisters were the first shopping mall in the United States of America. 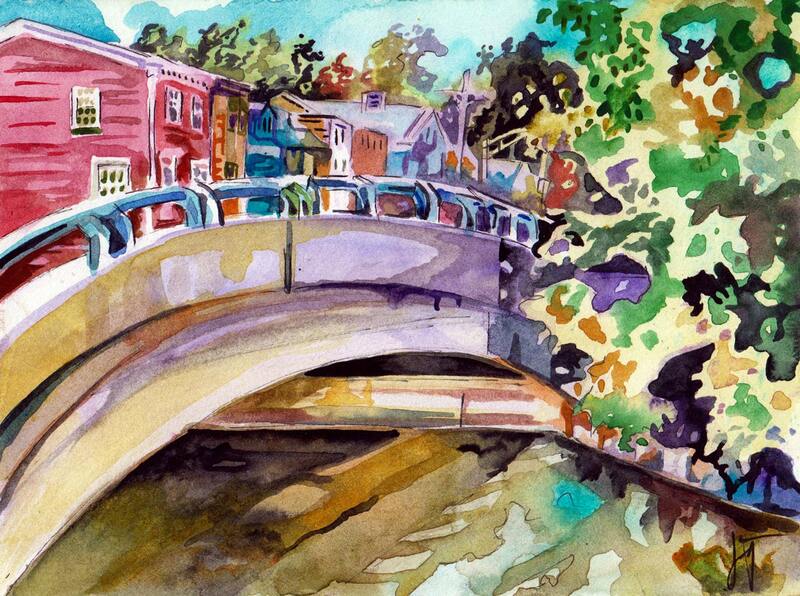 This painting depicts the seven sisters as they are seen from across one of the many bridges in Bridgeton. I painted this for the annual Cumberland County Painting Competition in 2014. This listing is for the original watercolor painting "The Seven Sisters" seen above. It is watercolor and ink on paper and measures 5 inches by 7 inches (12.7 x 17.78 cm). This piece was painted outside in one sitting. This type of painting is traditionally called plein air painting.